This article was submitted by an anonymous source about the book Colombia Arte Actual, which can be found at the Venice Biennial. We share it at AAL in the hopes that you will enjoy it. With plenty of enthusiasm and proud to be Colombian, I visited the Venice Biennale in Italy, where I had the opportunity to find a copy of Colombia Arte Actual. The book was located in the Germany pavilion, the country that was ultimately awarded a Gold Lion for Anne Imhof’s wonderful performance. It is truly a shame that Colombia is one of the few Latin American countries with no official pavilion at the Biennale; we continue to waste our resources at Artecamara to sell the illusion that Artbo is a great fair. The absence of Colombian artists was, in my opinion, even more strongly felt at the world mecca of art with this high quality book. 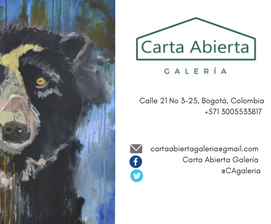 When I first saw the Colombia Arte Actual, it was being read by German art collectors to whom I asked permission to browse the book that captured my attention for being about contemporary Colombian artists. Later I found it at the France, Italy and Chile pavilions as well. It is an impeccable book, a luxury edition in both English and Spanish. However, what caught my attention the most, was an unprecedented situation history of Colombian art, the fact that the book, an initiative that is so essential to Colombia’s art scene, was published by a Chilean editorial, Arte Al Límite. They are responsible of supplying this relevant book, that not even the Ministry of Culture or the important Colombian editorials who specialize in art, like Nexus or Villegas Editores, had the idea of publishing. Once again, Chileans scored a great goal against us. The book is bound with an editorial quality and, above all else, it has the assertive texts of Colombian-Spanish curator, Jimena Peña, and a list of excellent contemporary artists led by Dario Ortiz and Maquiamelo, among others. Nevertheless, I dare say that the selection of artists and their prominence in the book serve obvious economic and marketing interests. Let’s recall that Chilean collectors have always been interested in the promotion of Dario Ortiz’s work, who they regard as they contemporary heir of a tradition started by the late Chilean artist, Claudio Bravo, a that a series of exhibitions by Maquiamelo will take place this year in several Chilean museums. Without a doubt, several hundreds of dollars are at play here. Although it is impossible to make an art book that encompasses all first-rate Colombian contemporary artists, two great one seem to have been forgotten: Rafael Gómez Barros and María José Arjona, artists who have certainly earned an important position in the art world and whose absence is unjustified. Not highlighting their work in this book that is being handed out in art fairs, museums and biennales worldwide I regard to be a insult for these renowned artists and their careers. The book is discriminatory in every sense of the word; how is it possible that great names are omitted and other ordinary artists are included like Rossina Bossio, with outdated proposals, or Milena Arango, a ghastly mistake given that she is an aspiring actress more than a plastic artist? I feel as though the selection of artists was random, and even if it was managed by a foreign editorial who managed to provide a great layout design and printing, one can tell that there’s something fishy, a hidden agenda like everything in Colombia. The Arte Al Límite editorial and curator, Jimena Peña, probably left out the previously mentioned artists and some others who didn’t have the connections or the luck to be featured in such an important publication. As we say in Colombia, the bad thing about connections is not having them.